Uganda is a country that is located in East Africa. The landlocked country is bordered by five countries. The official name of the country is the Republic of Uganda. The country has a population of almost 38 million, ranking it as the 35th largest country in the world in terms of population. With an area of over 93,000 square miles, it is the 81st largest country in the world by area. The capital city is Kampala, and it is also the largest city in Uganda. It has a dominant-part semi-presidential republic government with a president, vice president, and prime minister. The country’s motto is “For God and My Country,” and its currency is the Ugandan shilling. The country’s flag has bands of red, gold, and black with a bird featured prominently in the center. The country of Uganda has a GDP of $23.67 billion. The nominal GDP per capita was estimated to be $2,100 in 2016. Almost one-quarter of Uganda’s GDP comes from agriculture. The area is known for its tea, tobacco, and cotton production. Uganda is a landlocked country that is made up of savannas, mountains, and lakes. The endangered mountain gorilla resides in the Ruwenzori Mountains of Uganda. The country shares its borders with five other countries: Rwanda, Tanzania, Kenya, South Sudan, and the Democratic Republic of Congo. In terms of population, Uganda is the second largest landlocked country in the world. It falls second only to Ethiopia. About one-quarter of Uganda’s surface is made up of lakes and rivers. Grasshoppers that have been pan fried are a delicacy consumed in Uganda. The women of Uganda traditionally build the homes. They are responsible for constructing the walls of mud houses, while men build the roofs of these homes. The climate is tropical, and there are two dry seasons that run from December to February and again in June through August. English and Swahili are the country’s official languages. Other languages and dialects are spoken throughout Uganda. English that is spoken in Uganda is a different type of dialect and sounds quite different from what is spoken in the U.S. This language is referred to as Uglish. About 33% of Ugandans practice Roman Catholicism, while another 33% are Protestant. Pedestrians do not have the right of way when crossing or walking in streets in Uganda. Although you do have to watch for cars, the primary form of transportation for Ugandans are bicycles. Matooke is a staple food in Uganda. It is made with unripened bananas that have been mashed. Another kitchen staple? Meat stews. These dishes don’t just contain traditional meat. Liver, stomach, tongue, and intestines may also be thrown in. Malaria-carrying mosquitoes can be found in Uganda. They are typically active from midnight to 5 a.m. The Ugandan president is always called Museven. There are an estimated 52 tribes residing in Uganda. These tribes have their own customs that are still practiced to this day. About half of Uganda’s population is under the age of 14. Approximately one-third of Ugandans own a mobile phone. The country’s most beloved sport is football – or what is known in the U.S. as soccer. In terms of land area, Uganda is roughly the size of the state of Oregon. However, Uganda has a population that is roughly ten times larger than Oregon’s! Ugandans are known for their warmth and hospitality. In fact, the African Economist called Uganda one of Africa’s friendliest countries. Uganda gained its independence from Britain in 1962. The average life expectancy in Uganda is just 55 years. It is not uncommon for Ugandans to be late – punctuality is not very important. A person may arrive 30 minutes late, or sometimes even up to two hours after they were supposed to be there. Ugandan women are expected to dress modestly and should cover their legs. Pointing at a Ugandan with an index finger is an insult. When pointing, the whole arm should be used. This is true of many regions in Africa. Ugandan men always wear pants, even in the hotter temperatures. Only boys wear shorts. Foreign men can wear shorts, as well. At the height of Uganda’s civil war, nearly two million people were displaced. The country has won just two gold medals in the Olympics. The first was won in Men’s hurdles in 1972, while the second was won during the 2012 Olympics in Men’s marathon. 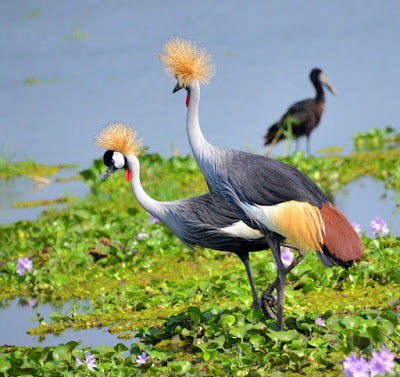 The national animal is the Grey Crowned Crane. This bird is featured on the country’s flag. Lake Victoria is the largest lake in Africa, and it’s located in Uganda. This lake is connected to the Nile River. Uganda is the second largest producer of bananas in the world, falling second only to India. The country produces an estimated 11 million tons annually. Public displays of affection are frowned upon by native Ugandans. About 66% of Ugandans work in the farming industry. A Rolex isn’t a watch in Uganda – it’s a type of fast food. This dish is a chapatti filled with sausage and includes other ingredients like vegetables. Ugandans are one of the top consumers of alcohol in all of Africa. Uganda is home to approximately 5,000 chimpanzees – more than any other East African country. Although it is a landlocked country, Uganda has many large lakes. The south of the country is heavily influenced by one of the world's biggest lakes, Lake Victoria, which contains many islands. Uganda's main cities are located in the south, near this lake, including the capital city of Kampala. Besides Lake Victoria there is Lake Albert, Lake Edward, and the smaller Lake George. Lake Kyoga is in the center of the country and is surrounded by extensive marshy areas. Uganda also has 60 protected areas, which includes ten national parks, two of which – Bwindi Impenetrable National Park and Rwenzori Mountains National Park – are UNESCO World Heritage Sites. These areas are home to many endangered species, such as mountain gorillas and hippos, and conservation in Uganda plays a significant role in the country's political economy, underpinning the tourist industry that accounts for a fifth of the country's exports.